Mya Cook and her sister Deanna attend Mystic Valley Regional Charter School. Leading civil rights and education groups directed a torrent of criticism at a Malden charter school Friday for disciplining black and biracial students who wear hairstyles that administrators say violate the school’s dress code. The state association of charter schools disavowed the actions of administrators at Mystic Valley Regional Charter School, saying they had trampled on students’ cultural heritage. The Anti-Defamation League questioned whether the school was equitably applying discipline policies. And the Lawyers’ Committee for Civil Rights and Economic Justice demanded public records from Mystic Valley to assess the impact of the school’s dress code on students of color. “Denying young black women their opportunity to express their cultural identity will not make the school safer, more orderly, or less ‘distracting,’ ” the committee said in a statement. 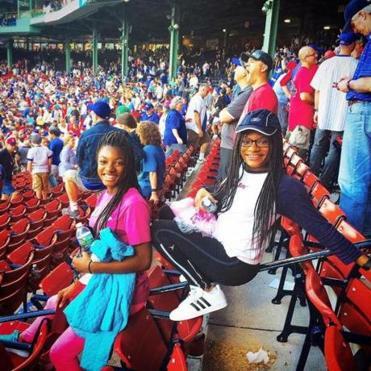 Students at the Malden school who wear hair extensions have faced detention and suspension by administrators, who said the hairstyle could highlight economic differences among students because of its cost. The girls at Mystic Valley Regional Charter School have been given detention, kicked out of after-school sports, and banned from the prom. Administrators sent a letter to parents Friday insisting that rules on attire and appearance are consistently enforced. “They are designed to permit students to focus their attentions on academics and on those aspects of their personalities that are truly important,” the statement said. “The specific prohibition on hair extensions, which are expensive and could serve as a differentiating factor between students from dissimilar socioeconomic backgrounds, is consistent with our desire to create such an educational environment, one that celebrates all that our students have in common and minimizes material differences and distractions,” the statement said. School administrators were not available for interviews Friday. More than 40 percent of the school’s students are people of color, but state education data show Mystic Valley has just one black teacher on a staff of about 170. Those records also show that black students at Mystic Valley were more than twice as likely last year to be suspended for any infraction compared with white students. The school’s desire to erase economic differences among students — to, in effect, create a level playing field — is reasonable, said Tomiko Brown-Nagin, a Harvard Law School professor who teaches education law and policy. But such policies, she said, can rub up against the equally reasonable imperative to be non-discriminatory. Brown-Nagin said courts have given employers and schools wide discretion in grooming codes but have challenged schools’ discretion when grooming codes infringe on cultural expression. Parents of Mystic Valley students who have faced discipline decried the school’s action as racist. They said students are being punished for wearing hair extensions, additional hair that is woven in. The parents said white students who color their hair — also against the school’s dress code — are not facing discipline. Hair extensions woven into braids cost about $50 to $200, and can last up to three months, a price on par with or less expensive than other hairstyles, according to a random sample by the Globe of salons from Boston to Malden. Outside the school Friday, a handful of students said they were outraged — but not surprised — by administrators’ actions. Jordan Towle-Jackson, a 17-year-old junior, said she had encountered racial ignorance from some students, and indifference by some administrators. “There have been racist comments, and when I went to the school’s director, he basically told me to go make a club to try and fix it,” she said. 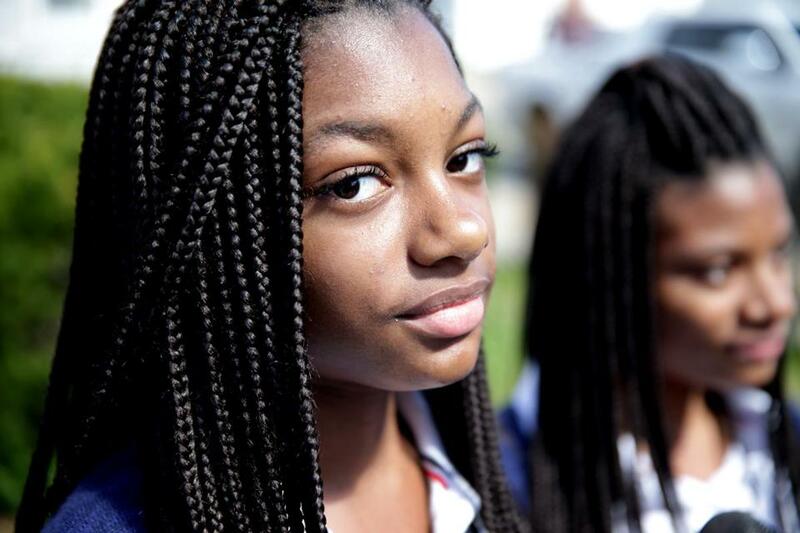 Mya Cook, one of the students who recently served multiple detentions for wearing braided extensions, said her hairstyle is not hurting anyone. Cook and her twin sister, Deanna, 15-year old sophomores, have refused to give up their extensions. Kiryannah Burkett, a 17-year-old junior, said the school’s dress code is especially challenging for black students because black hair grows differently than white hair, making it hard to follow rules that also ban hair that is more than 2 inches in thickness or height. The dress code drew the ire of the Massachusetts Charter Public School Association. “The policy and enforcement actions by the administration at Mystic Valley run counter to everything we — as parents, educators, as association board members — stand for and teach in our schools,” the statement said. Leaders of the state’s Anti-Defamation League had scheduled a phone conference for Friday with Alexander Dan, Mystic’s interim school director, after the parents of the Cook twins sought help dealing with the school. But the appointed time came and went, and no call came from Dan, said Robert Trestan, executive director of the Anti-Defamation League of New England, a nonprofit that fights anti-Semitism and other expressions of hate. Instead, the Anti-Defamation League received a one-line e-mail. According to Trestan, it said, “This constitutes our written response to your inquiry.” Attached to the e-mail was the statement Dan released Friday morning to parents. Globe correspondent Andrew Grant contributed to this report. Kay Lazar can be reached at kay.lazar@globe.com.